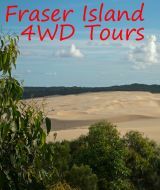 With your experienced island guide/driver enjoy the most extensive tour of Fraser island's great walks, highlights and hidden gems. Operating for over 20 years with access to the island two best campsites for hikes and walks on Fraser island, travel with walkit. Camping has never been easier with the great open campsites, fully fenced and fully equipped camping facilities including tents, mattress and sleeping bags at both Dundaburra and Dilli Village. 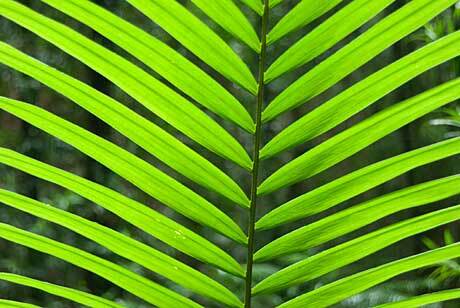 Both campsites offer hot showers, toilets, all island meals are provided and light snacks on longer walks. 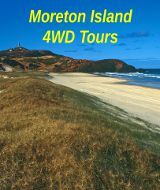 Rainbow Beach, Inskip Point, Ferry cruise to Fraser Island, Hook Point Birds, 75 Mile Surf Beach, Eli Creek and Maheno Shipwreck, Dundaburra Campsite, Wungul Sandblow, and for the adventurous walkers, Lake Bowarrady. For the causal walk - wine and cheese with beach sunset only metres from camp. Depart Brisbane and travel north via the Sunshine Coast Way and Noosa. At Rainbow Beach stop for an early Lunch and coloured sands beach walk. Crossing over by ferry to Fraser Island from Inskip Point Mainland. Travel along Fraser's 75 Mile Ocean Surf Beach. First stop, the famous Eli Creek. Freshwater delight, walk, hike, explore this area with a short walk to the Maheno Shipwreck for photos. Dundaburra campsite is situated among banksia protected dunes on the eastern surf beach with camp sites nestled amongst the trees. Dundaburra Creek borders the southern side of the camp and runs into the sea between Cathedral Beach's multi coloured sand cliffs. Starting at the western end of the Dundaburra campground this walk will take you through coastal mixed forest opening up onto an elevated sandblow providing terrific sea views. Magnificent moonscaping and an extensive hike to the ancient preserved forest for fit hikers is a highlight. Starting at Dundaburra creek this walk will take you through tall open eucalypt forest, swampland and vine thicket. Spot red-backed fairy-wrens and white-cheeked honey eaters amongst the abundant bird life. On the highlands beside this lake is a walk through the northern limit of Fraser Islands unique rainforest. Lake Bowarrady is extensive, isolated and footprint free - enjoy the solitude before returning to Dundaburra. Walk south along the eastern surf beach to the magnificent Cathedrals. 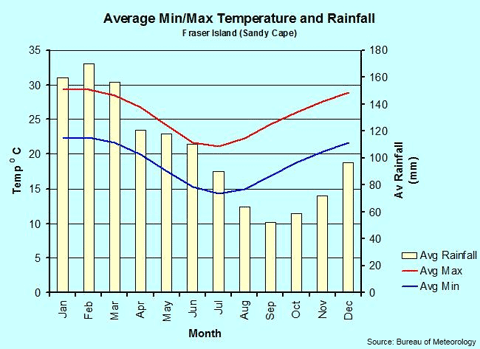 Here you will see striking examples of natures ability, through wind and rain, to sculpt the landmass. Marvel at the array of colours created by the weathering of iron-rich minerals over thousands of years. Walk to the beach for sunrise to see the red and yellow sands sparkel rays of colour. Walk north along the Eastern surf beach to the magnificent Red Canyon. This intertidal sand is full of life. Look for pipis, moon snails, sand bubbler crab colonies and ghost crabs. Go beach combing for treasure washed up by the seas. Keep your eyes peeled for white breasted sea eagles and watch pied oyster catchers digging for pipis. After a great day of highlights, enjoy the sunset beachside with a few sundowers, wine and cheese on Fraser Island's surf beach. Take hot showers and settle into camp, relax around the campfire, as a healthy meal is prepared. Enjoy wine with meals. Dilli Village campsite is situated behind the sand dunes on the eastern surf of Fraser Island. This campsite is the Start of the Southern Section of Fraser Island Great Walk. The Campsite has the newest hot showers and toilets on the island and is a grassed fully fenced. 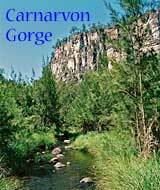 The Campsite is 100 metres from the surf beach via a wooden bridge across the famous Govi Creek water hole. 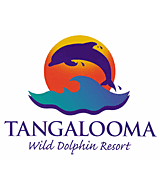 It is excellent for swimming, and a bonus for the campground with soft tea tree coloured fresh water, and a huge amount of animals using this area for water. (List of animals). From the campsite walk through coastal heath wetlands, angophora and scribbly gum woodland and mixed forest to the tea coloured waters of Lake Boomanjin the worlds largest perch lake. On arriving walk around the lake to the west. This ancient sand is dead white, with red tea coloured water making a photographer's paradise. The paper bark trees (over 1000 years old) lie close to the sand for protection. Walk the magnificent eastern surf beach. This intertidal sand is full of life. Look for pipis, moon snails, sand bubbler crab colonies and ghost crabs. Go beach combing for treasure washed up by the seas. Keep your eyes peeled for white breasted sea eagles and watch pied oyster catchers digging for pipis. Walk North along the beach 1km to Govi Creek where beautiful photo's can be taken of Lilly Pond's and water holes formed before the red water flows into the sea. 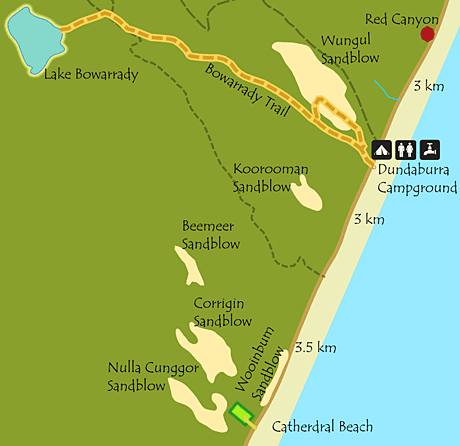 Wongi Sandblow was the first of the sandblows noted by Captain Cook in 1770. 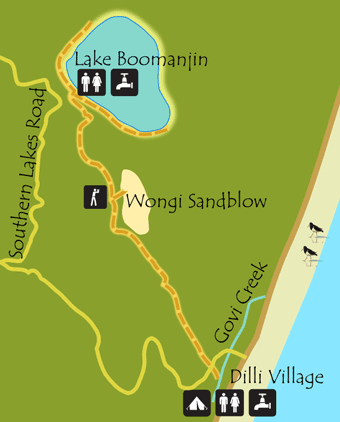 Access to this sandblow is via the Lake Boomanjin walk and is well sign posted. Sea views and photos. Isolated and remote. Take care to follow your foot prints back from exploring this sandblow to the entrance track. Relax morning before a easy hike into Lake Wabby. This hike to photo the amazing sandblow. Be amazed by this green lake. Relax enjoy the lookout walk, or take a dune walk solo. Return via walking track to eastern surf beach. Regretfully it is time to pack up and return to civilization. Before leaving take a walk along the beach, waterhole or many sand tracks. Than the final exciting run down the rugged Fraser coastline, before the ferry cruise to the mainland, Rainbow Beach, Noosa and Brisbane. Maps, brochures, tide times, 4 postcards. Call us for a free mail out of this kit.